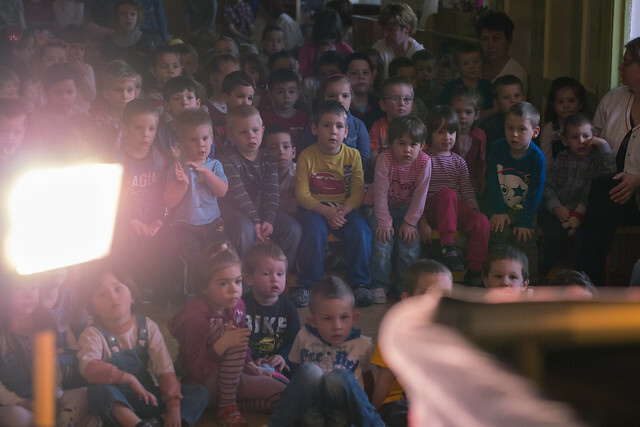 Above: Zsolti greeting some of the kids in Bogács. Tonight I invited Zsolti from Apc to join me to travel to Bogács. It was a great opportunity to encourage each other in the car as the travel time to Bogács is about one hour. 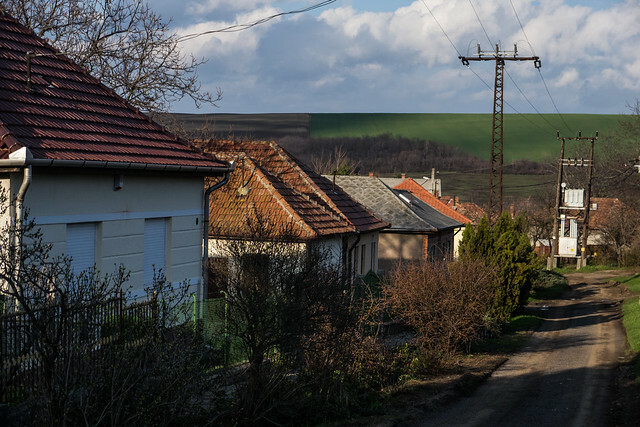 Zsolti comes from the same influences and experiences as the Romani families we visit in Bogács. In reality, Zsolti may even be worse off in many ways than these families, yet he trusts in Jesus and has experienced God's gracious provision and deliverance. I was thankful for his company and how God used him to give testimony of how Jesus is trustworthy and how the life of faith in Him brings peace. Above: Gyüszi with his mother Aranyka. Pulling around the now familiar bend towards Gyüszi's house, kids playing on the streets parted to allow us into his driveway. Today was a beautiful day and Gyüszi's family enjoying the weather outside waved us in to our normal spot to park. The oven that is used to heat his house was now outside spewing smoke as Gyüszi's mother Aranyka made noodle soup. I greeted her with a smile as I could see she was fully recovered from her sickness. She returned a smile and patting her neck saying, "See, look at this. I don't feel the cysts anymore! There is no more swelling!" I told her, it was Jesus who was gracious to heal her. Within minutes, Csali (Ödön's wife) appeared. Last week her spirit was downcast and she wondered, "Has God turned away from us? Is He angry at us? Everything is going wrong." I shard that God was not against her but for her. He sent Jesus Christ to die for our sins and He lives to save us and give abundant life, not to make our lives miserable. Satan on the other hand seeks to steal, kill and destroy (see John 10:10). Last week, we prayed for God's help in these tough times. Tonight, Csali shared how the next day after we prayed, God had led her and her husband to find a man who said he was waiting for them to help get rid of iron scraps. These iron scraps are used by Romani to trade in for spending money for food. Csali said they didn't know the man, she didn't know why he was waiting for them and that it had to be God, because the house was not familiar to them. Her husband Ödön sat back and just smiled and added his agreement that God provided. 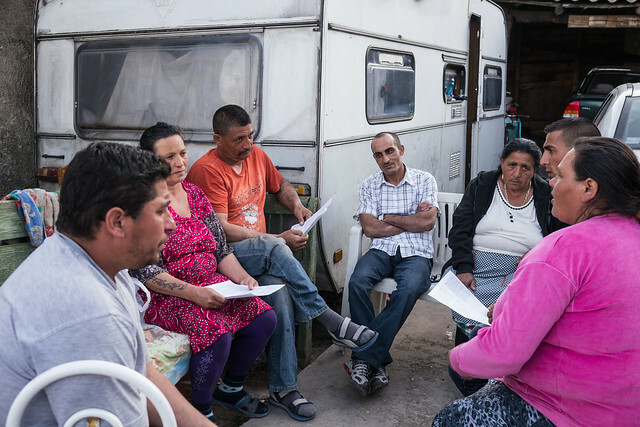 After Gyüszi's sister Babi showed up, it was time to begin the study gathered around in a circle outside in their driveway. Gyüszi facilitated the meeting, reading from Luke chapter one. After discussing what they discovered in the passage, Ödön spoke about how he learned how nothing was impossible for God and therefore nothing was impossible for those who put their faith in him. 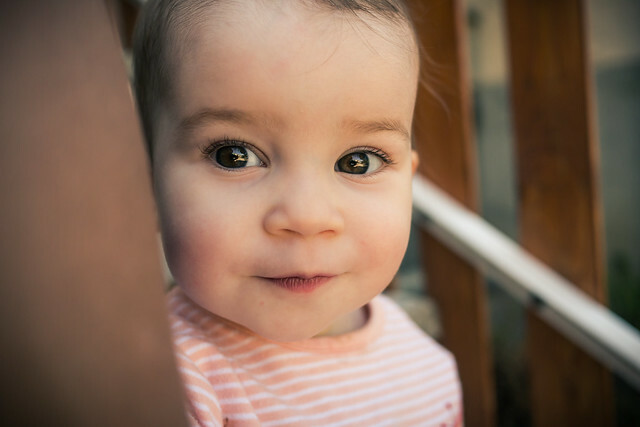 Gyüszi learned that since God was able to give Elizabeth (known as barren) a child, that he should not lose hope in his situation, but trust that God can provide in the most impossible situations. Before leaving, I explained to Gyüszi that I would not be able to come next week, but I wanted them to meet without me. After some initial reluctance, he said, "I'll try." Others who were there said they would attend next week as well. 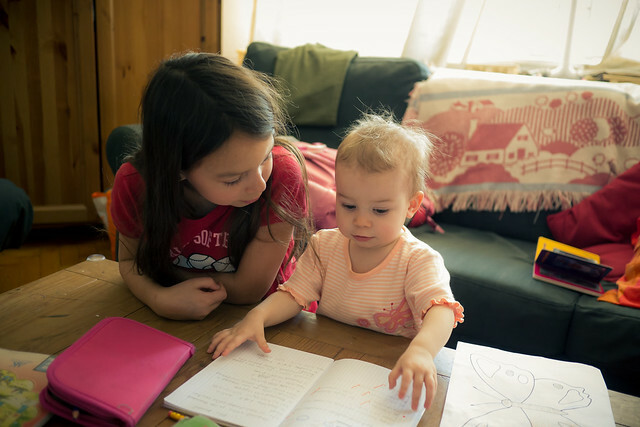 Please pray that they would meet (even without me being there) as it is my desire that they continue to read God's word together giving them opportunity to be taught by God. "Everyone who has heard and learned from the Father comes to me." 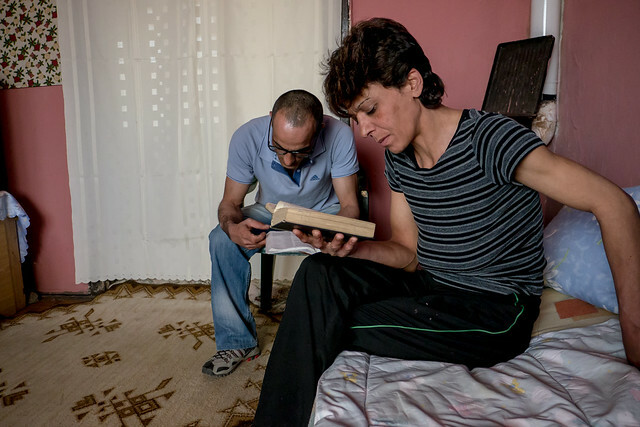 (John 6:45) Please pray for Gyüszi as news has gone from bad to worse regarding his efforts to keep his family together and being restored to the house he once lived in. God is our only hope in the matter. 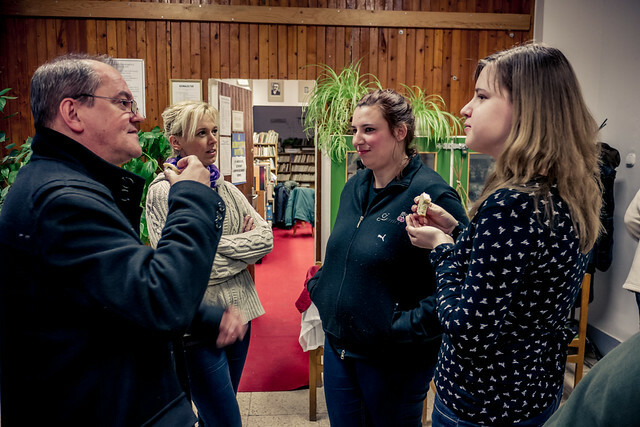 On our way home that night, I shared my story of how God lead me to Hungary with Zsolti. It is always refreshing to remember God's faithfulness then and how He has continued to be faithful to this day. One question that Gyüszi's sister Babi asked me tonight was where I would most like to be if it were up to me. I said that I simply want to be where God wants me to be. As I celebrate my 41st birthday on Wednesday, I rejoice that God has graciously led me into His plan for my life. A plan so much bigger than me and a life I could have never imagined. On Thursday, I was off to Apc to help Zsolti and Vincse with the new Bible study in their home in Apc. I was thankful to see many new guests, including Zsolti's adopted daughter attend and Zsolti's nephew attend. After briefly conversing with the guests, I found out that three of them had no Christian background. First we studied the account of Jesus telling Peter to cast his net into the deep to catch some fish. Peter had just spent the whole night fishing without success but said, "But at your word I will let down the nets.” (Luke 5:5) We learned about the importance of faith in Jesus and how His way (although different than what we would consider normal or what we are used to doing) is the best way. Above: Ibolya, who was among those who were not believers attending, asked some important questions after the meeting. She lost a child over seven years ago and it caused much confusion and questions to arise about God. The Lord was gracious to bring encouragement to her after our conversation and she wants to continue seeking. Just as in Bogács, I won't be able to attend next week so Zsolti will be facilitating next weeks meeting. Please pray for this new group of seekers and Christians to hear from the Father through reading His word and be transformed by His grace as they follow after Christ. Above: After struggling for a few weeks with sickness and teeth coming in, Ziva is now well and enjoying the sunshine outside. She loves going outside to take walks with dad, picking flowers and locating bugs on her journey. On Sunday, our family is off to another country to have fellowship with fellow PI missionaries from all over Europe. Please pray for our souls to be refreshed, built up and equipped in our week together. Gyüszi jokingly told me, "You're in for it Allen! My mom was asking why you didn't stop by last week to pray for her." Seeing Gyüszi's mom this week brought me great joy. Instead of being curled up and sick under her blanket as I saw her two weeks ago, she was sitting up and saying, "Look, look, look how much better I am! Look at my neck where you put your hands and prayed. The swelling is gone! And I'm breathing much easier now." As people walked in moments after me, Aranyka continued pointing to her neck, "Look, the swelling is all gone. Really, I'm not just saying this because he is here, it's really better!" As usual, I reminded her that it was Jesus who heals and not me and I thanked Jesus with her in prayer for the help He sent in His grace. Above: Tonight’s study in Gyüszi’s house. Our study tonight was from Isaiah 53. I was thankful to see God giving them understanding about details of Christ's work of atonement revealed in this passage. They were amazed at God's power to know the future and predict exactly what would happen to the Messiah. They recognized that men would reject Him, just as they do in this day. They saw that it was God's will to send Him to be crushed for our sins so that we could be forgiven and have peace with God. Basic truths, amazing truths, Gospel truths! Józsi (photo above sitting on floor with Bible), who initially was one of the most antagonistic in the group has been coming constantly to the studies. When Gyüszi who facilitated the study asked, "How can you apply what you have learned from this passage to your life? ", Józsi began sharing that he needs to believe, but he is not quiet there yet. Pray that they Jesus would get Józsi and the others to the place of seeing that today is the day to repent and believe the Gospel! I have to admit, today was tough meeting with Gyüszi and his sister Babi. Their daily struggle with poverty is so oppressive that it is difficult for them to grasp the love of God and His faithfulness to deliver in their own lives. I know that what I have to give them are riches far greater than anything obtainable in the world. If they would have Jesus, they would have all they need. But I say that as one with all my physical needs supplied, never living in poverty, never lacking heat in my house, never wondering if my children will have enough to eat. On the other hand, my new friends Vincse and Zsolti (see last post) are living in poverty and are very much trusting God as their Provider. And they have story after story of how God miraculously provided for their needs. Prov 30:8-9 comes to my mind when I think on these things: "Remove far from me falsehood and lying; give me neither poverty nor riches; feed me with the food that is needful for me, lest I be full and deny you and say, “Who is the LORD?” or lest I be poor and steal and profane the name of my God." Babi who does not know this Scripture often says to me, "Allen, I don't want to be rich. Just pray that I have enough for my family that we don't wonder how we'll feed our kids each night." 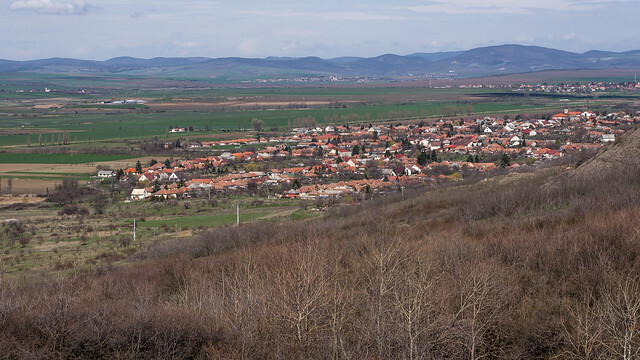 Many of these families feel impelled to cut wood from the forests in the mountains to heat their houses in the winter knowing that this is illegal in Hungary. If they are caught, they are required to pay a fine that is equivalent to their age. If they are 40, they have to pay 40,000 forint (177 dollars). Jobs are scarce for Hungarians, and even more so for the Romani people who in most cases are not educated and discriminated against. They feel trapped in a hopeless situation and in feeling desperation. 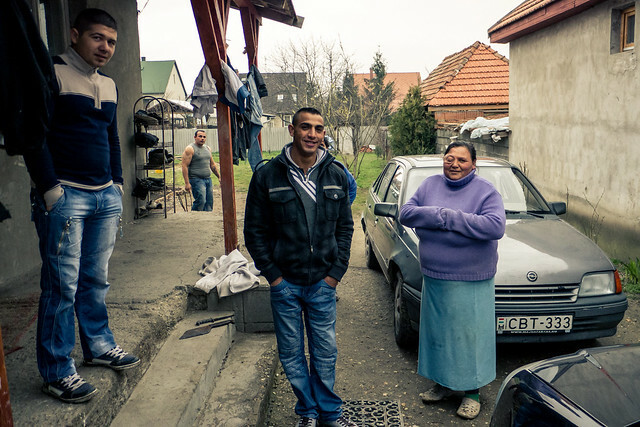 My friends in Bogács find it hard to imagine a life where living honestly while trusting in God to provide would actually lead to having enough (and even more than enough). Instead, feeling abandoned by all and lacking opportunity to legally work, they strive in their own strength to find ways to survive, even if illegal. 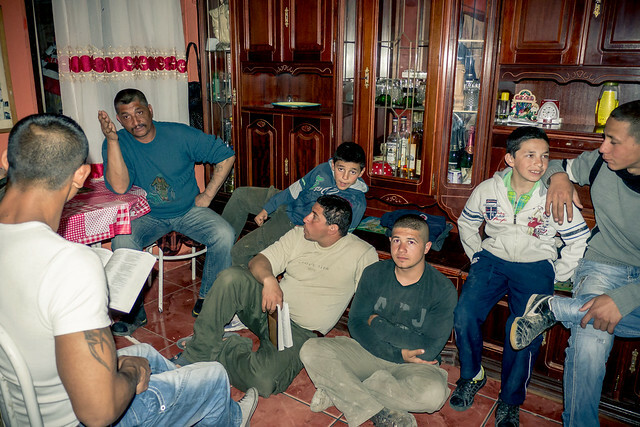 Please pray for this household in Bogács to come to know the LORD of Psalm 9:9-10: "The LORD is a stronghold for the oppressed, a stronghold in times of trouble. And those who know your name put their trust in you, for you, O LORD, have not forsaken those who seek you." Please pray for Gyüszi's household to be delivered from poverty by His grace. 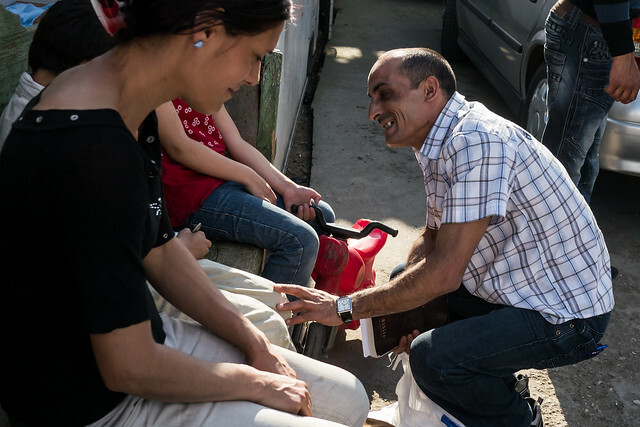 Pray for Gyüszi's family to find opportunity for work, and for Gyüszi to be delivered from the threat of his kids being taken away by social services. Pray that the LORD would reveal Himself as a stronghold for them and show them that He does not forsake those who seek Him. As I mentioned in a previous post we planned our first meeting on Thursday with new friends Vincse and Zsolt in Ápc which is a neighboring village of Petofibanya. Parking my car, I saw Zsolti greeted me at his gate. Above: Entering the house, I was thankful to see Érzsi (white sweater), a member of our church that had recently moved to Ápc. What is joyous about seeing her is God's amazing work to bring together those who would not normally be together. 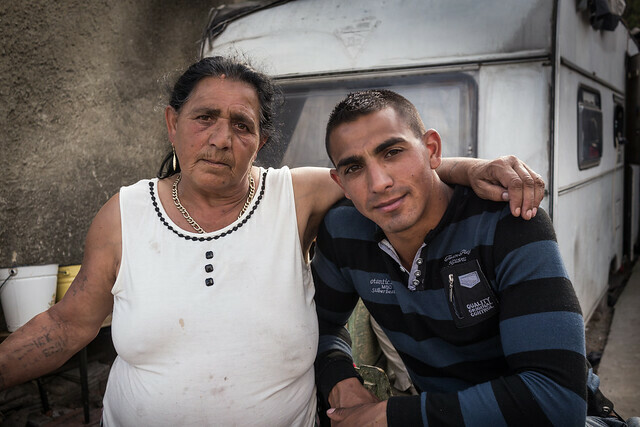 Hungarians would in no normal circumstances be the guest in the home of a Romani family. God destroys racial barriers and brings unity through Jesus Christ! 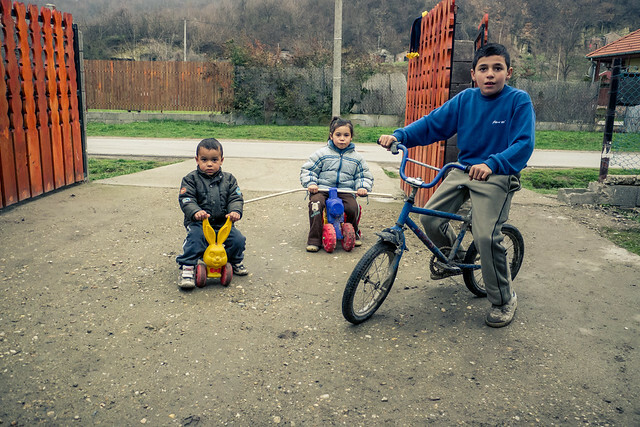 Since our church was born in Petofibanya, a town with a limited number of Romani families, there has not been an influx of Romani members. This is now changing, and Érzsi personified for me this night how our church proclaims walls broken down in Jesus Christ. Eph 2:14, "For he himself is our peace, who has made us both one and has broken down in his flesh the dividing wall of hostility... that he might create in himself one new man in place of the two, so making peace." Some guests that stopped by this night but were not able to stay were Róza (photo above next to Érzsi) and Zsanett who is Érzsi's landlord. Róza from what I understand believes, but is not in fellowship anywhere. 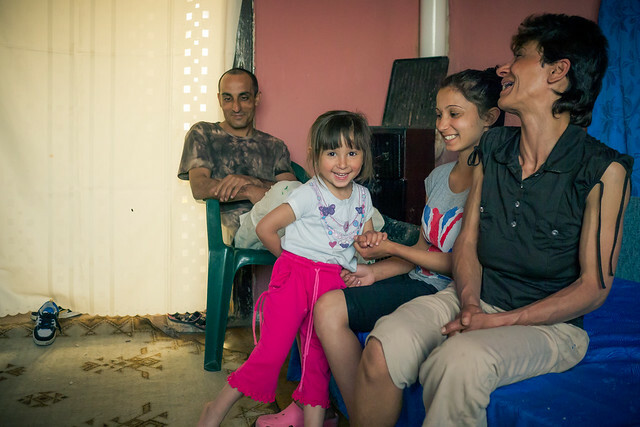 Zsanett expressed that she was not saved, but that she does believe in God. We were thankful for the brief time meeting these guests and for the hope that they as well as their families may end up attending in the future. 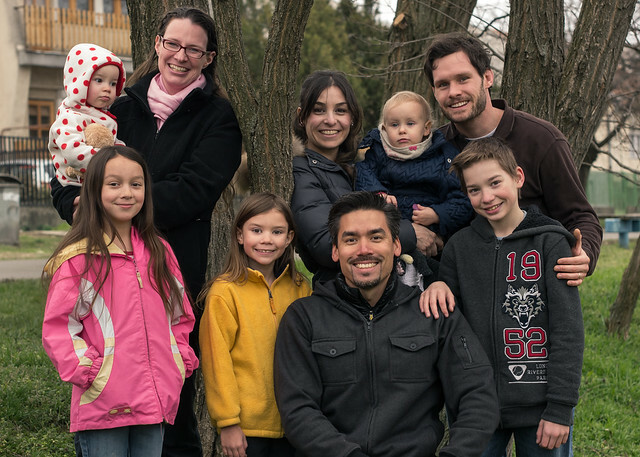 There are many more connections that Zsolti and Vincse have in town and they have long had a desire to see God's kingdom grow in Ápc. I praise God for this open door and for God's continued mission to "bring good news to the poor." (Isa 61) Please pray for Zsolt to find work and for them to continue to grow in their walk with Christ. Pray that God would pour out His Spirit on Ápc proclaim His good news through us. 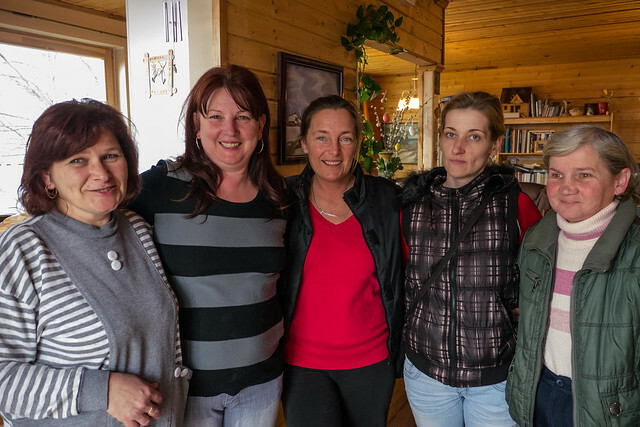 Above: The above women, Mónika, Mariann, Judit, Tamara and Zsuzsa continue to attend a Baptism/Foundations of Faith study together at Miki’s house. Judit first met us years over 7 years ago attending one of our English classes in the community. Now 7 years later she has reconnected with us and has put her faith in Jesus. Today she expressed excitement as her husband has begun asking questions about God. Please pray for him (Joplin) to have his questions answered and for us to have opportunity to connect with him personally. Above: Pulling into Babi’s driveway and greeted by Áron, Gyüszi and Babi. Once again, our meeting in Bogács took place in Babi's house. Babi greeted us outside and apologized that her house wasn't very warm. Although the weather is finally truly feeling like spring, this night significantly dropped in temperature. Her house, like most other families in this area is heated with a wooden oven. Even though windows are cracked due to poor oven ventilation, there remains the constant smell of smoke building in the room. Every now and then a family member swings the door open bringing in a burst of fresh, but cold air. There was a smaller group gathered tonight. Babi, her husband and son, Gyüszi and his wife Melinda and one of Gyüszi's friends who ended up leaving as I was talking with Babi before getting started with the Bible study. In our conversation, it became clear that Babi still carried around the weight of guilt about a specific sin that she had already repented of and confessed to God. God led me to talk about the necessity of not only believing God's Word that He forgives, but also personally receiving that forgiveness. I was surprised to see Gyüszi often cutting in the conversation and correcting Babi's wrong understanding about God. At one point, Babi said, "Maybe God is busy with more important matters than me, maybe He's off somewhere else." Before I could answer, Gyüszi said, "God can hear all of us at the same time. He is in all places. And God has resources that do not run out. He has been providing from the beginning of the world and He still provides." Gyüszi went on to tell Babi what he had learned a few weeks ago in our Bible study saying, "God knows your thoughts even before you speak them!" The irony in this conversation is that Gyüszi didn't believe in God when we first began our studies and Babi was the one with the most faith. Now Gyüszi was encouraging his older sister and helping her to gain a greater understanding of God through what he learned from Scripture. I have been incorporating a Bible study method that is designed to train others in a simple way to study the Scripture, understand what God is saying, and obey what is understood. I have modeled how I do the study for 9 weeks and after prayer felt that tonight it was time to turn over the facilitation of the group to Gyüszi. This would mean, he would read the chosen Scripture, then allow the group to rephrase what they just heard in their own words. Then he would ask three questions: 1. What does this passage reveal about God. 2. What does this passage reveal about man. 3. How should I apply this to my life? This form of study keeps God's word central and Scripture is the teacher while the facilitator is the person who simply directs the group's attention to Scripture and the three questions. Gyüszi did an excellent job facilitating the group as we finished the story of Moses and the Passover. 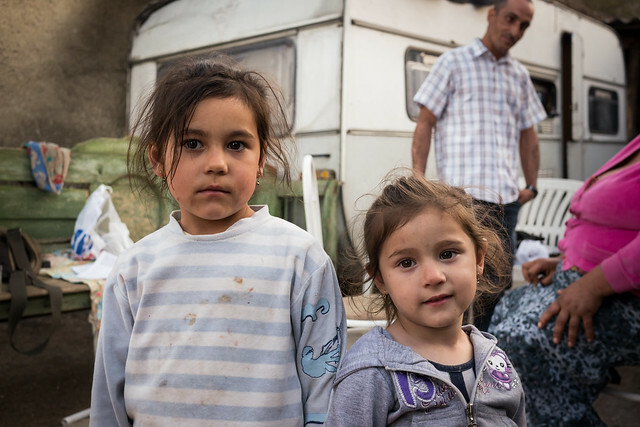 Gyüszi has times of great discouragement in life as there is the continued threat that social services will take away his kids because of their current living conditions. Instead of hopelessness, it is clear he is turning to God and hoping in Him for deliverance. 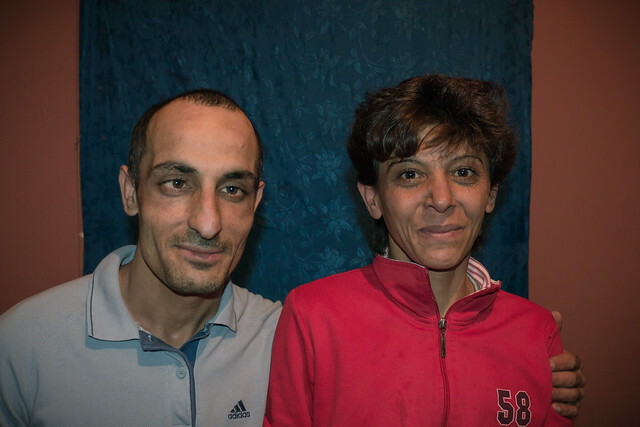 Please pray for Gyüszi and his family to be able to remain together through God’s grace. 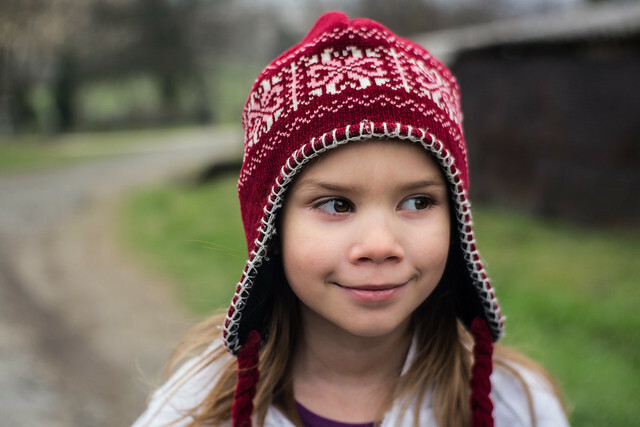 Pray for healing for Babi’s eye and for God to provide work for those struggling financially in Bogács. Pray for our Bible Study times to lead them to Jesus and to understanding the Gospel. Above: Our new friends Zsolti and Vincse (Vin-cheh). God filled Sharon with compassion toward Vincse months ago when she saw Vincse digging through trash in our town to provide for her family. On one occasion handing off a bag to Vincse with some helpful food items, Vincse said, “May the Lord bless you.” Soon after, it became clear that Vincse was our sister in Jesus Christ! After inviting her into our house for prayer and also to our house group, she attended a few weeks later with her husband Zsolti who is also a believer. Both of them have had a difficult past few years, Vincse suffering from a respiratory sickness and Zsolti struggling in his faith. It turns out that the church they had previously attended did not offer them much help to grow spiritually. As we continued to meet, it became clear that they have a heart to spread the Gospel and a love for Jesus that was now being renewed through fellowship with our body in Petofibanya. Above: The town of Apc where Zsolti and Vincse live. This Thursday it is our hope to begin a new Bible study in their home in Apc, which is a neighboring village of Petofibanya. We have long sought God’s direction as we desire to see a church planted in this town. Zsolti and Vincse have already spread the word and we hope to see family members and friends attend next week. Please pray for this new work and for God to build up Zsolti and Vincse in their faith in Christ. I believe they are key people in God’s plan to bless this village. Pray that God may also provide for them in their poverty so that they have enough for their own family and enough to extend generosity toward others (which they have a heart to do). Above: Eszti, Marcsi and Brenda (just back from the US) prayer walking through the town of Rozsaszentmarton. 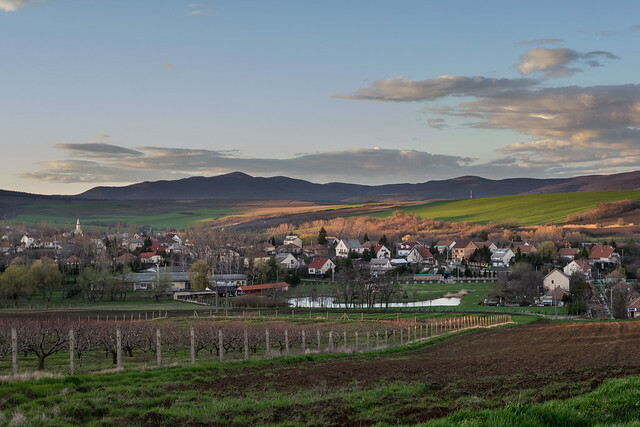 As we put more emphasis on prayer as a team as the foundation of church planting, every other week we’ve been joining together to prayer walking through Rozsaszentmarton. Above: The colossal church building in Rozsaszentmarton that we pass by when praying through the town. It is my prayer that there may be a people raised up as God’s living church that become more glorious for Christ than this building. So many in this town hold onto religious traditions, yet they have no personal relationship with God through faith in Jesus Christ. In this town, if you are not Catholic, you are a sect. This mindset has given us great resistance in bringing the Gospel to kids through our puppet ministry in this town’s public school. One family that attended one of our children’s day outreaches in the local community center was publicly shamed in the town’s Catholic church for associating with us. Please pray with us for breakthroughs in this town that open doors to spreading the good news of salvation in Jesus Christ. Last Saturday we held a special time of church planting training for various members of our church and other growing leaders from other towns that we have been mentoring. Above: Attila (also serving with Pioneers in Hungary) leading our first session. 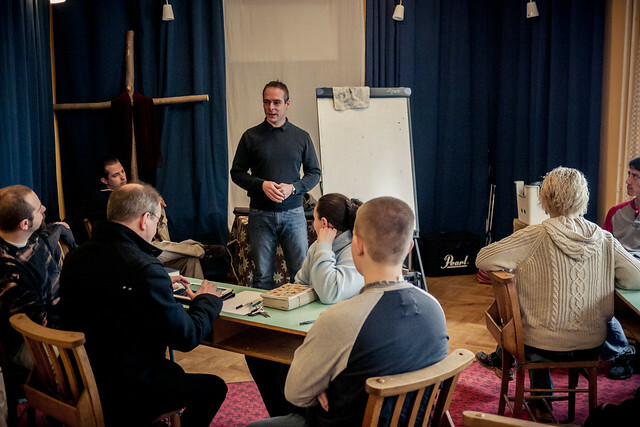 Zsolti in striped shirt and his wife Ildikó (turned away from camera) from Jászfényszaru attended the church planting training. 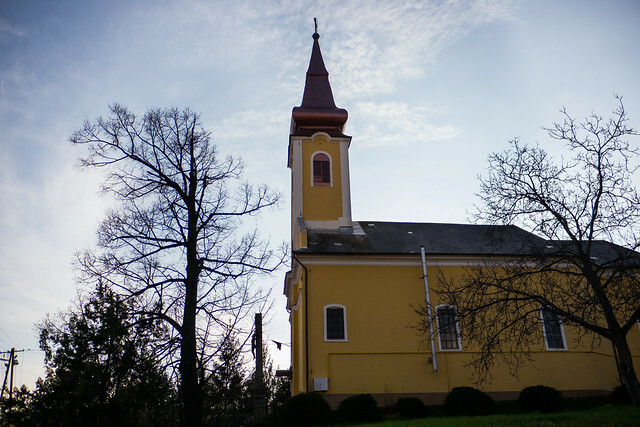 They have been commuting to our church for months and have a desire to see a church planted in Jászfényszaru. 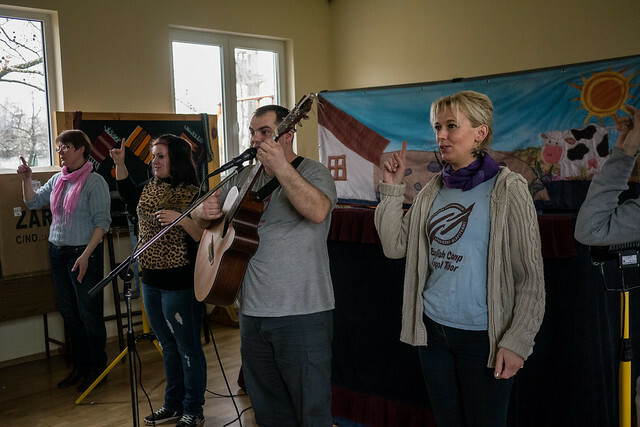 Teammates Miki and Dezso have been mentoring them and helped launch a Bible study in Zsolit and Ildikó’s home last week. Among those attending was a coworker that Zsolti has been reaching out to. 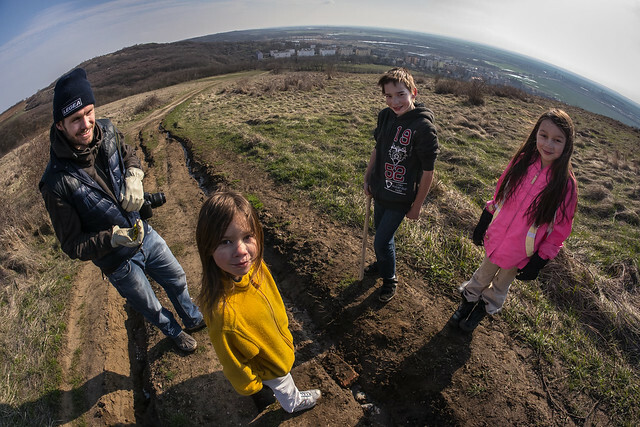 Please pray for this new work as well in the town of Jászfényszaru. Above: Some students from our advanced class: Dezso, Erika, Mercedez and Eszti. Our fist hour of class involves conversation about our personal lives. Many times, God opens up opportunity to share the hope we have within us and students like Mercedez have taken notice. Just last week she began asking more questions from teammate Erika who then forwarded various short films about Christianity. On Friday, Nick Vujcic is coming to Hungary. If you are not familiar with his story, you can read about his ministry here: http://www.lifewithoutlimbs.org. After discussing his visit in class, Mercedez expressed interest and now is planning on attending Nick’s presentation in Budapest on Friday with Erika and her family. Please pray for Mercedez to come to know Jesus Christ personally. 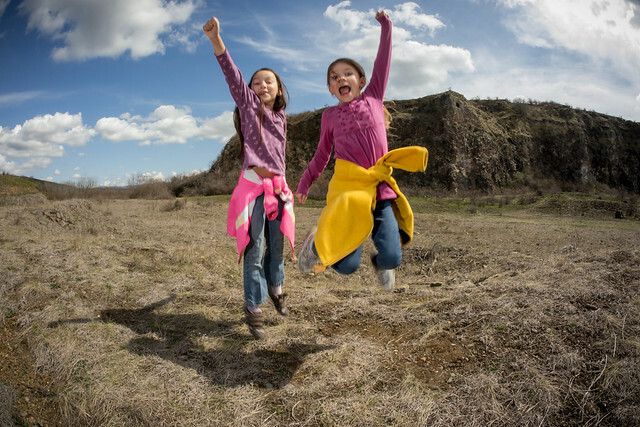 Above: Ellie and Kira jumping for joy in the mountains behind or village. After a long battle with freezing temperatures, we think that Spring is finally here! We have enjoyed the beautiful weather God has sent over the past few days. 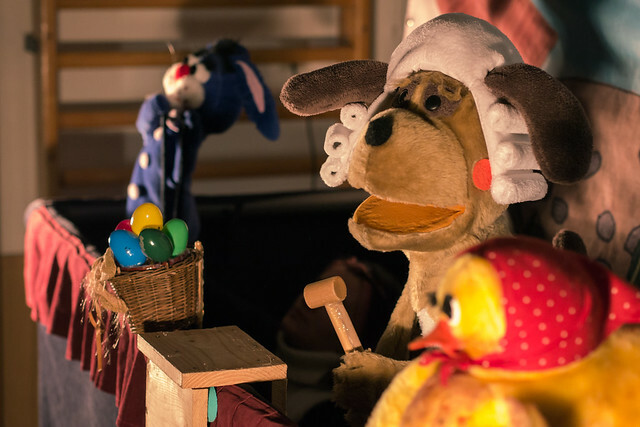 On Thursday we traveled to the city of Jászberény for one of our last Easter puppet performances. This school cares for those with various disabilities and we had a large group consisting of all ages. 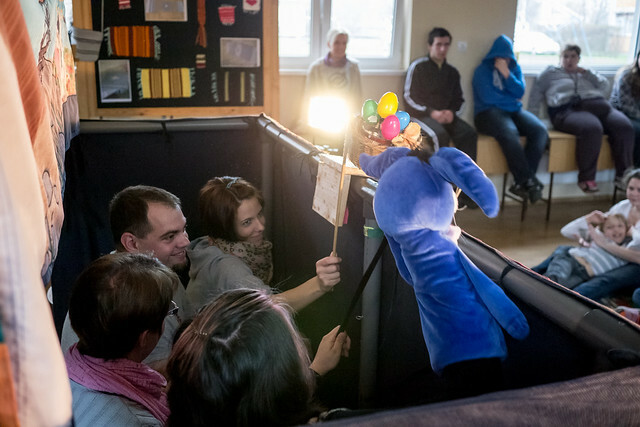 Above: One of the teachers helping a child join in singing with motions. Above: The boy sitting in the arms of a teacher above moved me with compassion. I approached him after the show with a deep desire to pray for him. As I held his hand I asked his teacher what the redness was on his nose and forehead. She said that he often hits himself. There were bruises all over his body. As he writhed around in her lap I saw that his lower back was also bruised. I asked her if I could pray for him. She said, “Yes, we’ve tried so many things, I just hope there is some solution.” I brought Szabi to Jesus in prayer for deliverance from this evil and torturous influence in his life. 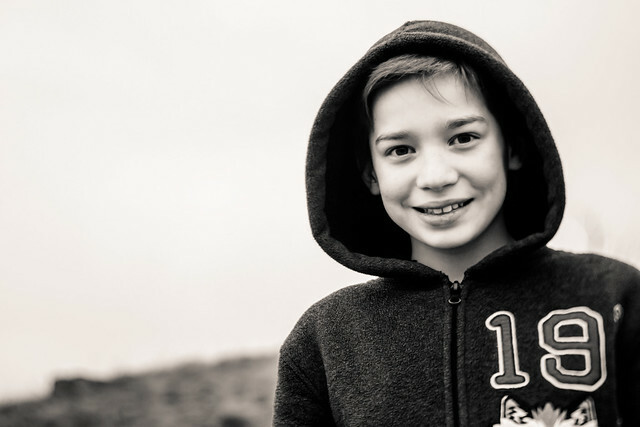 I would ask you also to pray for Szabi, who brought to my mind the story of Mark 9:21 where a father brings a boy suffering from childhood to Jesus for healing. The Biblical account has the father saying to Jesus, “‘It has often thrown him into fire or water to destroy him. But if you are able to do anything, have compassion on us and help us.’ Then Jesus said to him, ‘If you are able?' All things are possible for the one who believes.’” Join me in praying for Szabi’s deliverance because all things are possible for those who believe in Jesus. Above: After the show some of the kids were kind enough to give us various handmade crafts as gifts. For now, the stage is packed and tucked away in my basement until our last show at the end of April in Gyöngyös. We appreciate your prayer support and experienced God’s answers over these past few weeks of ministry. This had to be one of the best years as far as larger groups of kids staying attentive when we began sharing the Gospel at the end of the show. 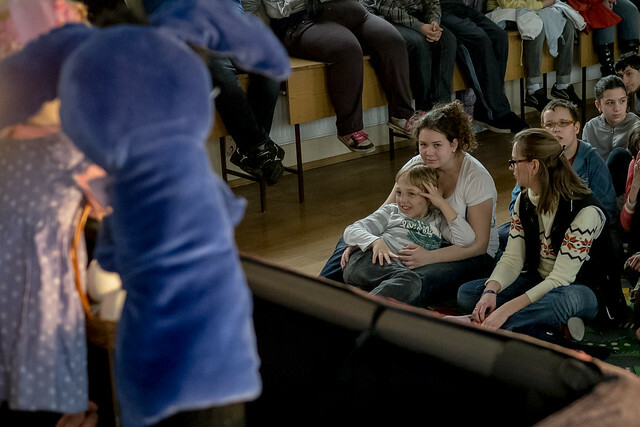 Even today, the principal commented on how amazed she was to see the full spectrum of ages participating and paying attention throughout the show. God was gracious to protect us as we traveled through treacherous conditions and sustained all of our technical equipment. He protected our team from sickness and injury and we rejoice in His mercy poured out on us and on these kids this Easter. 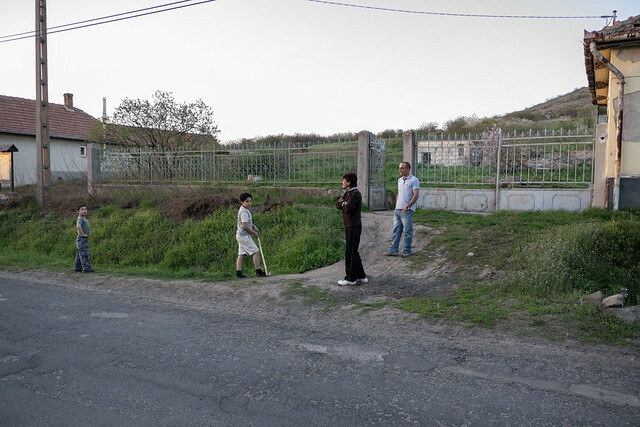 Tonight, Gyüszi directed me to Babi's house (Gyüszi's sister) once I entered the town of Bogács for our weekly Bible evangelistic Bible study. Walking in the front door, I found Babi, sick and and covered up on the couch in the kitchen. I greeted her with a smile and could see she was discouraged. Moments after I arrived, another family member entered and handed her some medicine. Babi went on to explain how she was not only physically sick, but feeling spiritually hopeless. I sought to turn Babi's attention to what God had been doing in her life and how He had brought obvious healing in the past weeks. I reminded her of the hope we have in Jesus and His great love for her which was made clear in HIs sacrifice for her sins on the cross. Babi was so depressed that she was not asking for prayer but simply agreed when I asked if I could pray for her. I laid my hands on her and brought her to Christ in prayer. Afterwards, she glared at her husband and said, "Really? I can't believe this. It's like a great weight has been lifted from me!" For a few more minutes she remained on the couch as I sat directly in front of her with another friend Jozsi who joined us for the Bible study. Then, she threw off her covers, got up and began serving people coffee. The change in her countenance was truly amazing and I couldn't help but think of the time when Jesus touched Peter's mother-in-law and healed her of a fever. "He touched her hand, and the fever left her, and she rose and began to serve him." (Mat 8:15) Babi was even smiling and moving about the room like a energetic child. Praise God for His grace in bringing healing physically and encouraging her spirit. Whatever oppression she was experiencing when I entered had been taken away by Jesus. She sat and listened as we began our Bible study continuing the story of Moses freeing God's people from Egypt. Above: Gyüszi (left) and Ödon (right). Ödön who hasn't been able to attend for the past few weeks was able to come tonight and was very active. He was amazed at Pharaohs hard heart and wondered why God just didn't kill him. I listened as Gyüszi and Jozsi explained that God was using Pharaoh to display His ultimate power over those who claimed to be gods and arrogantly defied God. I was thankful to hear from various men that they had watched TV Easter specials on the life of Jesus and recounted to me what they had seen over the weekend. 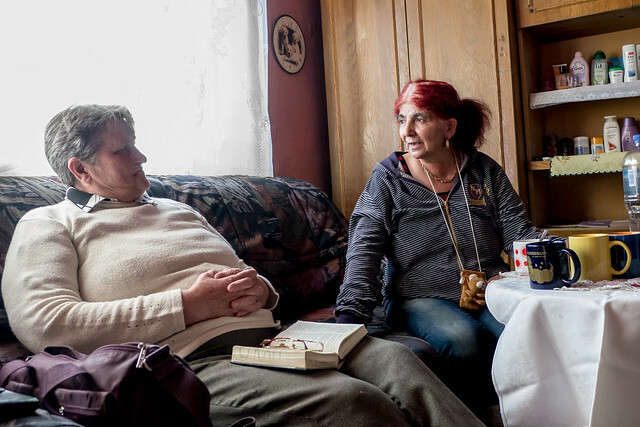 These families are struggling to make ends meet and living in tough conditions. Would you pray with me for them to put their faith in the Risen Christ. 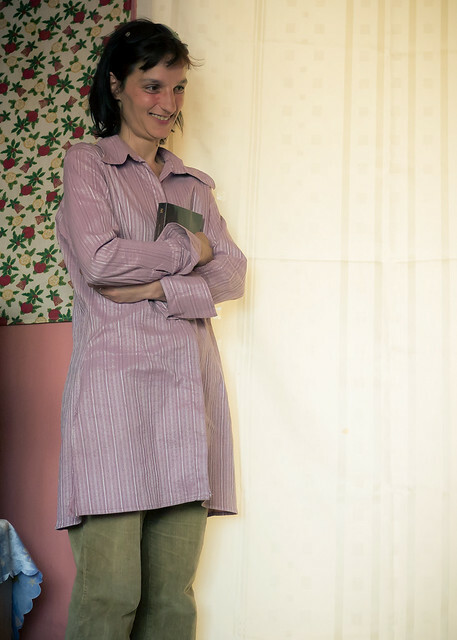 Pray also for God to provide for their many needs and minister healing to Gyüszi's mother Aranyka (respiratory sickness) and Babi (head and eye). Babi continues to report that the pain she once had has not come back since praying for her. I continue to ask Jesus to open her closed eye that she might see again. In the midst of our Bible study on Tuesday, I saw that Babi was touching her closed eye and squinting her face. I stopped and asked, "Is everything o.k. Babi?" She said, "It's like I'm seeing a small beam of light in the corner." Please continue to pray that Babi's eye would be restored by God's grace. Gyüszi who is my main contact in Bogács has been very discouraged this past week as the threat of his kids being taken away looms. He shared with me how much he has been praying. He even asked me if there was anything that I needed prayer for and promised to pray for me. His faith continues to grow and he needs your prayers! Above: Sharon’s cousin Sam, his wife Marina and daughter Leyla came to visit us over Easter. Sam lives in Italy with his family and we were thankful they made the long commute to spend some time with us. Above: Hiking in the mountains behind our village (Petofibanya seen above Ben’s head). 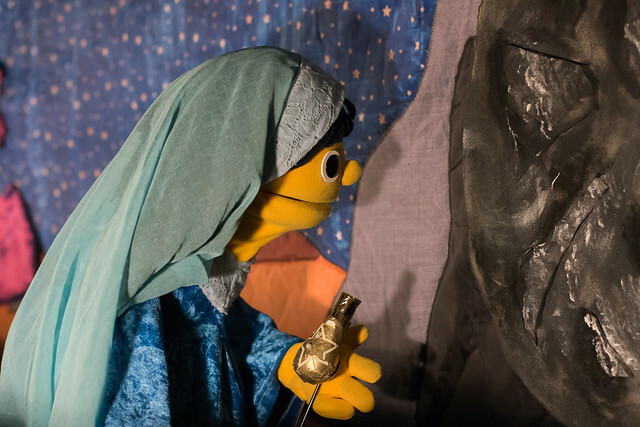 After a wonderful Easter break celebrating the resurrection of Jesus Christ, we were back out sharing this great news through our Puppet Ministry in the town of Hatvan. 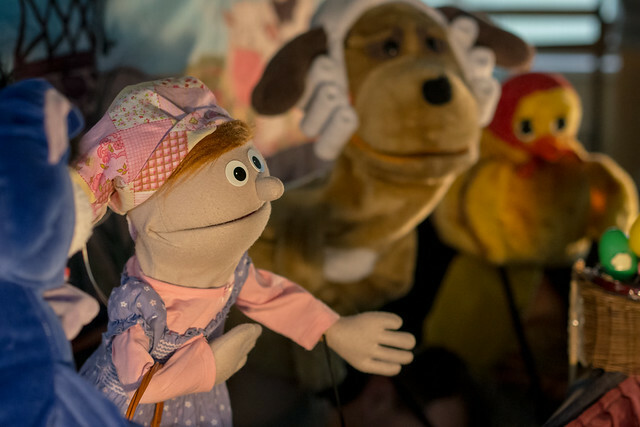 We praise God for His continued protection and provision in this Easter Puppet Ministry. 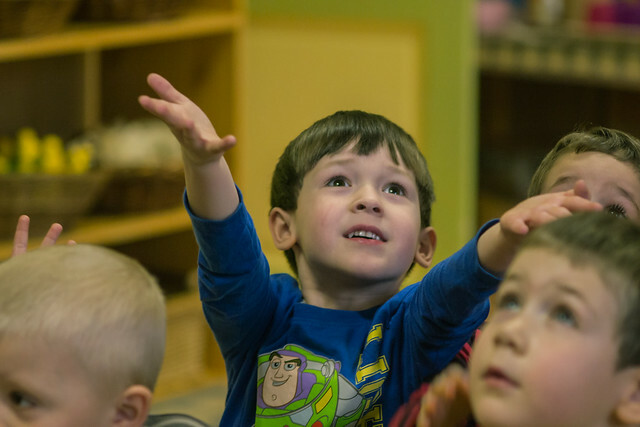 When Miki asks the question, “What is Easter really about?”… it is a joy to hear kids shout out in the audience, “The resurrection of Jesus Christ!” We’re very privileged to be able to sow these seeds of the Gospel to these kids and teachers. Once again, even though we had a large room full of kids, they did a great job paying attention when Erika began teaching at the end. 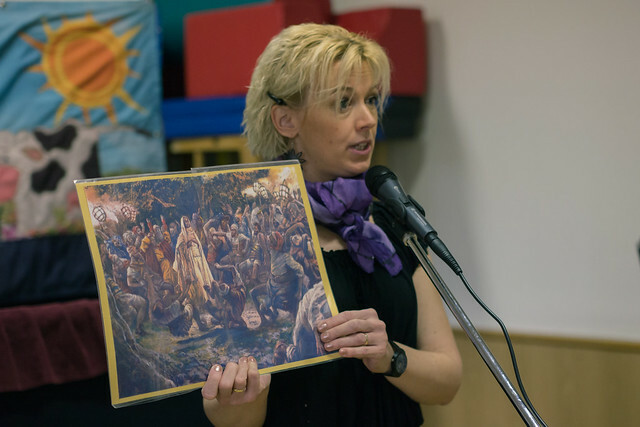 Praise God for this answer to prayer and for His Good News continuing to be shared with more and more in Hungary.